PCBB’s full-service, SaaS CECL solution includes all 7 methods, offering the flexibility to reconfigure methods, as the market conditions change. With over 20 years of experience and the only bank providing a CECL solution, PCBB brings a unique approach for a successful CECL implementation. Our Banking Experts provide you with as much or as little assistance as needed and guide you every step of the way. 2019 CECL Survey - Chance to win a $300 Yeti cooler! Each year MST, now Abrigo, has been implementing an allowance survey. This year we’re asking about your progress in the CECL transition, how you are preparing and what you are determining in terms of how CECL will impact your institution. As always, we’ll compile answers and share the results so you can compare what you are doing with your peers. We encourage you to participate. As a token of our appreciation, you will have the chance to win a $300 Yeti cooler or a Bluetooth speaker. We wish you a productive and profitable 2019! There’s no question about it: Data and Digitization are key to your financial institution's future success. 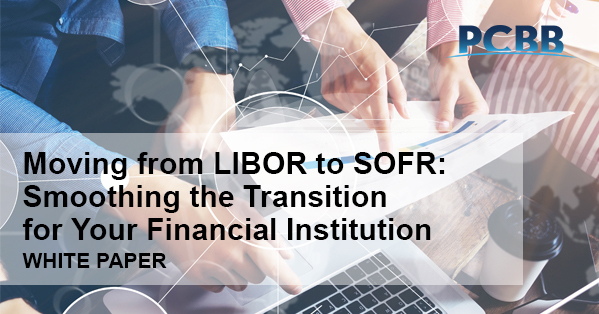 If your institution is not developing a plan to adapt and meet consumer demands in this increasingly digital world, you risk ceding your position to other financial institutions and non-bank competitors alike. Attend the Velocity Solutions Executive Summit on February 5, 2019—FREE to financial institution executives*—to learn proven strategies that will help move your credit union into the digital revolution by harnessing the power of big data, digital solutions and automation. *Includes the one-day seminar, one hotel night, your roundtrip airfare and event-related meals. As CECL deadlines approach, what aspects of preparing for implementation will your institution focus on first? With so much information, it can be hard to know. In a recent Banc Investment Daily (BID) article by PCBB, we put together a list of the Top 5 Things to Remember when preparing for CECL implementation. Take a look. See why more than 925 of your peers have purchased loans from Bankers Healthcare Group, at the upcoming Nashville Info Seminar. Engaging seminar - Hear from the Founder/CEO and the c-suite leadership team in finance, credit, regulatory, marketing, sales and analytics. Understand the 5 convenient, hassle-free methods to purchase loans. Network with key BHG personnel and other community banks from around the US. Email us at bhgbanks@bhg-inc.com or call 866-461-5069 to find out the details! About BHG: Bankers Healthcare Group (BHG) is a well-established, direct lender that has a commercial loan program specifically tailored to the business needs of licensed healthcare and other professionals. BHG has provided over $4 billion of these originated, underwritten and funded loans to 925+ community banks throughout the US since 2001. Using CECL Data to Drive Innovative 2019 Strategy? What information will your management team use to make 2019 strategic plans? What about your CECL data? Analyzing your CECL data can give you granular insight to guide a more thoughtful, innovative strategic plan. With a deeper understanding of long-term trends within your institution this data can help to identify products to promote or discontinue, assess validity of long-term goals, evaluate pricing structures and so much more. To learn more, read this article by PCBB's Melinda Davis on driving business through innovative insights. No trusted CECL partner yet? No problem. Join Sageworks Senior Portfolio Risk Consultant, Adam Kingsmore to learn best practices and see a demonstration of Sageworks ALLL software solution. For those who are currently building out their CECL models, did your results not match your expectations? Are you confused on what to do next? What happens if I don’t have enough loan-level historical data? What do I do if my results are zero? Are there shortcuts for anticipating when certain approaches won’t work before building models to test? Sageworks risk management consultants Brandon Quinones and Danny Sharman will answer these questions and discuss how results can be interpreted and pivoted to other approaches that may provide more transparent outcomes. Many financial institutions are having challenges interpreting their CECL modeling results. Join this webinar to learn what to do and how to pivot. The Current and Expected Credit Loss (CECL) accounting standard, ASU 2016-13 (Topic 326), outlines that the allowance for credit losses should be a valuation account deducted from the amortized cost basis of financial assets. Amortized cost basis includes, but is not limited to, adjustments for accrued interest, unamortized premium and discounts, and net deferred fees or costs. Entities valuation techniques should present the net amount expected to be collected on the financial asset. This complimentary document is intended to cover amortized cost basis application, specific guidance, and conceptual soundness under the context of ASU 2016-13 (Topic 326). Whitepaper: Learn key detail about the amortized cost basis of financial assets under CECL and how it can be applied with real scenarios. Key differences between qualitative adjustments and “reasonable and supportable” forecasts and the role each will play in estimating the allowance under CECL. Different approaches to apply forecasts within CECL calculations. Sourcing and documentation of forecasts and data for supporting qualitative adjustments. There are many questions around the subjective aspects of the new standard: Q factors and economic forecasting. This webinar addresses them. Last chance to register: CECL webinar panel TODAY! In this CECL webinar panel, hear from a banker, three auditors and two consultants who are helping institutions through the critical accounting change. As CECL is approaching, financial institutions are evaluating vendors to help them automate their allowance processes. From methodology selection, economic forecasting and proper loan pool segmentation, manual calculations will be more difficult to implement under CECL as credit losses need to be predicted over the life of the loan. CECL presents institutions with new guidance for measurement of the ALLL. While initially daunting, the transition exercise is, fundamentally, a project management problem; there exists a specific set of activities that, if performed correctly and thoughtfully, will reduce a compliant and defensible estimate of credit losses over the life of a financial asset or pool of financial assets. The documentation of that set of activities is the purpose of this Practical CECL™ Transition Guide: a series of 9 whitepapers to better assist with your transition. Access this complimentary series of eight whitepapers to help make a pratical transition over to the new CECL accouting standard. In August, Sageworks launched one of their newest products, “Insights”, to help leaders leverage loan portfolio data in new and meaningful ways. Lack of and limited access to bank-wide data, accompanied by time-consuming analysis, can hurt leadership’s ability to make well-informed, timely decisions. In this complimentary group demonstration, we aim to show how our newest offering can help bridge that gap. View a complimentary group demonstration of Sageworks' newsest product, Insights, and learn how to unlock actionable risk insights. The transition to the FASB’s CECL accounting standard is well underway for many financial institutions. In this panel discussion, hear from a banker, three auditors and two consultants from Sageworks, MST, Grant Thornton, BKD and PWC who are helping thousands of institutions through this critical change. They’ll discuss how CECL has influenced everything — implementation, validation, organizational changes and more while addressing your top concerns and questions.